Since its founding in 1922, Foreign Affairs has been the leading forum for serious discussion of American foreign policy and global affairs. It is now a multiplatform media organization with a print magazine, website, mobile site, various apps and social media feeds, an event business, and more. Foreign Affairs contributors drive the conversation about the most crucial issues in the world today. The Foreign Affairs website, powered by Drupal, offers a combination of print magazine content and web original content on global affairs, international business, science and technology, history, and society. Magazine articles originated in Adobe InDesign and the web production staff members went through a tedious copy and paste process to extract the content from InDesign and publish it online with proper formatting, appropriate metadata, and online categories. In addition, content producers were taking web original content from Drupal and pasting it back into InDesign to create a folio, or issue, for the iPad Extra, the bi-monthly collection of content that complements the monthly digital edition in the Foreign Affairs iPad app. Foreign Affairs looked for ways to simplify the print-to-web, web-to-tablet, and web-to-eBook workflow process and eliminate the rekeying of information that already existed in either InDesign or Drupal. 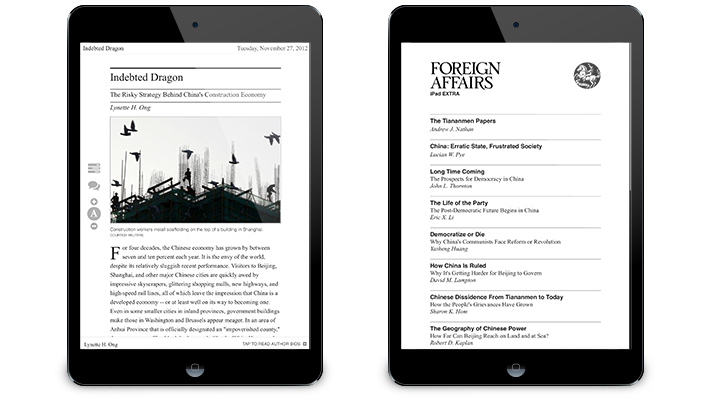 In November of 2012, Foreign Affairs launched its premiere iPad application using the Adobe Digital Publishing Suite (DPS) and the consulting services of DPCI, an interactive technology agency that helps organizations create, publish, enrich and deliver content to Web, print, mobile, and tablet devices. That project was viewed as a great success, and so Foreign Affairs management brought DPCI in to provide Drupal consulting and development services to help staff rapidly publish content for the web, iPad, and eBook. DPCI worked with Foreign Affairs stakeholders from the online, editorial, and production groups to gather requirements for customization and implementation of three content delivery components: InDesign to Drupal, Drupal to EPUB, and Drupal to HTML for Adobe DPS. DPCI analyzed various InDesign articles and corresponding Drupal 7.x content types to develop a mapping between article content and Drupal fields using style sheets and XML elements. DPCI then configured Foreign Affairs InDesign templates for XML export. The styles applied in InDesign are retained during the transfer and mapped to styles in Drupal for Web presentation. Next, DPCI configured existing third-party contributed modules for Drupal and created sub-modules to automate the import of XML content into Drupal from watched folders. Through a custom menu in InDesign, content producers can add metadata to the article and trigger the XML export. 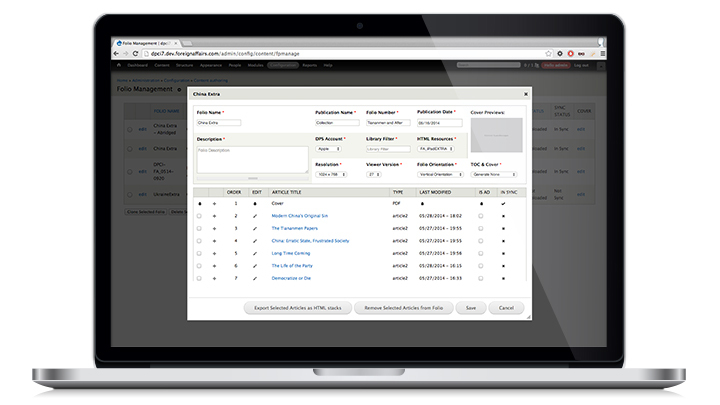 An automated set of processes then imports the articles and corresponding metadata into Drupal. With the InDesign to Drupal integration, Foreign Affairs content producers no longer have to copy, paste, and re-format print magazine content in Drupal. Instead, with the click of a button, the print content is exported from InDesign in a Drupal-compatible XML format then ingested into Drupal with the correct section and metadata assigned, ready for a web producer to review and add finishing touches before publishing live to the Foreign Affairs website. 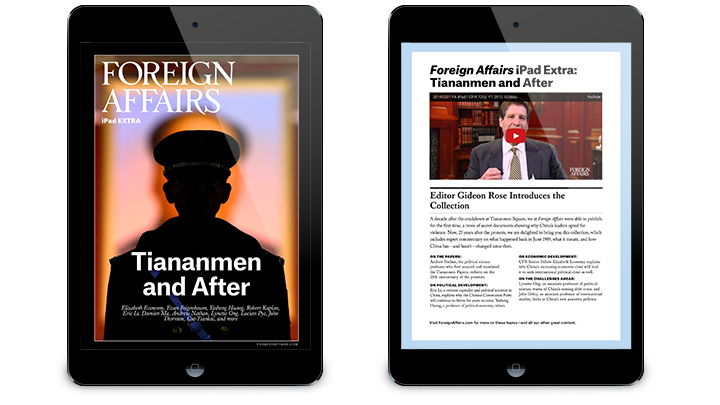 The Foreign Affairs iPad app, created with Adobe DPS, includes two digital publications: Foreign Affairs magazine and the iPad Extra, a bi-monthly collection of web-original articles to supplement the magazine. Previously, Foreign Affairs staff copied and pasted content from Drupal into InDesign to create the digital only iPad Extra issues. This was a cumbersome process that took staffers significant time to complete. Given that DPS supports HTML articles and the web-original content all resides in Drupal, DPCI recommended that Foreign Affairs consider a solution that takes the Drupal content straight to DPS. DPCI implemented DPSBridge, a Drupal 7.x module actively maintained by DPCI that exports web articles as packages for import into Adobe DPS folios as HTML articles. This eliminates the need to copy, paste, and format web-original content in InDesign for the iPad Extra collection, a time consuming task. DPSBridge converts selected articles into HTML stacks and then uploads the articles directly to the DPS Folio Producer by utilizing the Folio Producer APIs. In addition, DPSBridge compares each selected Drupal article with the version in the DPS folio and alerts users when the content is out of sync. A user can then simply click update to refresh the contents of the folio to utilize the most current version of the Drupal article. DPCI then defined CSS for Foreign Affairs to style the HTML to match the print magazine format, keeping the user experience consistent across the digital publications. 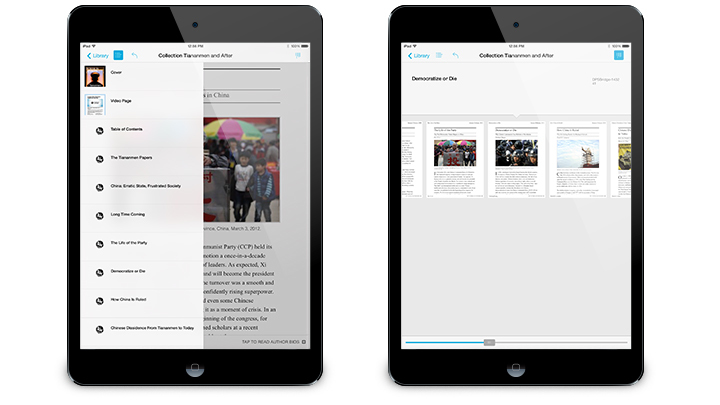 In addition to the HTML DPS Articles created from Drupal using DPSBridge, Foreign Affairs requested a matching companion PDF of the iPad Extra publication for other distribution channels. By using a combination of third-party contributed modules for Drupal and Adobe Acrobat actions, DPCI created a process to automate PDF document creation. Pulling from the same issue article lists as DPSBridge, Foreign Affairs staff can quickly export companion PDF issues using this workflow. DPCI extended Drupal 7.x to export a collection of articles into EPUB format, eliminating the need for Foreign Affairs to manually format content to send to vendors for distribution in eBook form. Instead, the HTML content from Drupal is used to generate the EPUB file, ensuring that all styling from Drupal is preserved. DPCI configured existing third-party contributed modules for EPUB export from Drupal and created a sub-module to further extend the out-of-box functionality, to meet Foreign Affairs unique table of contents and pagination needs. 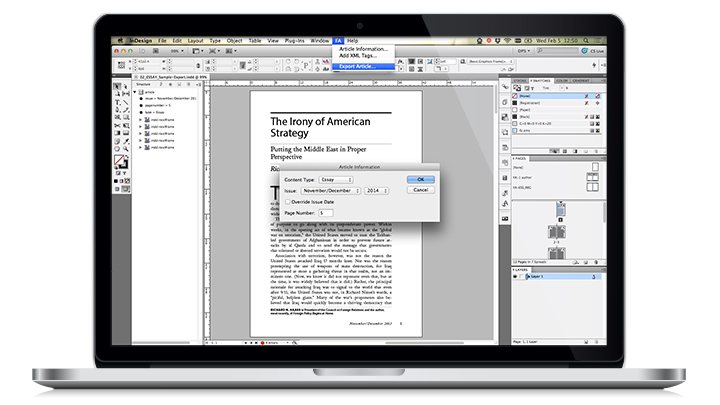 By connecting InDesign with Drupal and then Drupal with Adobe DPS, EPUB, and PDF, Foreign Affairs has a simplified process by which content is prepared for delivery in multiple formats. Web producers no longer need to manually copy, paste, and re-format content from InDesign and instead can focus on further enriching the content for the website. For the iPad Extra collection in the Foreign Affairs app, Foreign Affairs can now create the folios straight from the source content in Drupal, without any interaction with Adobe InDesign. “Working with DPCI to simplify our production workflow has not only saved our editors countless hours of work,” said Lynda Hammes, Publisher, Foreign Affairs at Council on Foreign Relations. “It has been a critical step in future-proofing the magazine's content formats for new digital products.